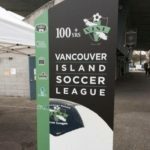 Very much like Rich Harden throwing curve-balls, and Ian Lamplugh ringing them up, the VISL had its own share of valuable performances in last weekend’s top flight amateur soccer on Vancouver Island. Cowichan continued with their workman type attitude and travelled down the Malahat to defeat rising Lakehill 1-0. Tyson Black scored the only goal of the game, and Keeper Darian Achurch recorded yet another shutout to add to his very impressive resume over the last couple years. 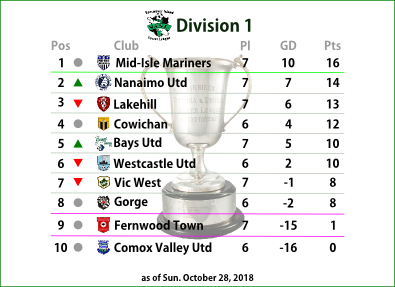 Comox Valley’s struggles continue, and Bays rebounded from a disastrous couple weeks to blank the North Island Boys by score of 6-0. 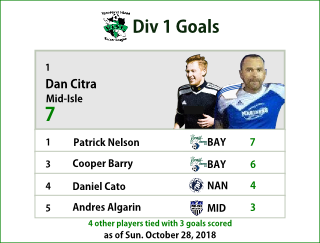 Patrick Nelson feasted and had a hat trick, Cooper Barry, Brandon Wallace, and Manny Straith had singles; while Andrew Flello picked up the shutout for the green and whites from Oak Bay. Mid Isle continued rolling and moved into sole possession of first place by taking out Vic West 3-1, who scored first on a goal by Riley O’Neil. But Mid Isle’s goals by Colin Jacques, Dan Citra, and Aly Adeeb did in the storied franchise. Westcastle and Nananimo battled to a 1-1 draw. Westcastle went down a man in the first half, but still had a strong match, and could have earned all three points. The young lads goal scorer was Kalen Park, while Matt Mehrassa scored a beauty for Nanaimo, who lost their share of top spot with the dropped points. The last game of the weekend featured a goal fest at Blanshard as Gorge defeated Fernwood 5-3. Fernwood’s goals were by Josh Cuthbert, Gordon Elliot, and Nick Graham. Gorge goals by Dominic Colantonio, Jon Shah, Drew Brittain, Mike Dunham, Mike Moon, and Brennen McCleary. An amazing pre-Halloween weekend of soccer where many were dressed up as Alphonso Davies! After those amazing individual efforts, here is how the Division 1 Golden Boot is shaping up – it’s a close race so far. Gorge are going to be tested as the young Westcastle team seem to be hitting their groove nicely. The Friday night game should attract some viewership as the young squad play a good style of soccer and Gorge look to turn their season around. 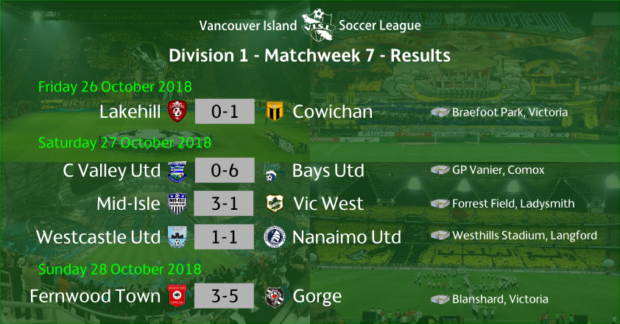 Bays have been struggling, but are coming off a convincing victory after travelling to Comox – a very big test in itself. They will look to knock off the Mid Isle squad, who are hot and at the top of the division – pretty good for a team that was just promoted this year. Saturday will play host to our Game of the Week. We get on the road and travel to Merle Logan to celebrate the special day Nanaimo United has planned. A family friendly day to celebrate the amalgamation of the youth organization Harbour City, with the historic United club in existence for 100+ years. 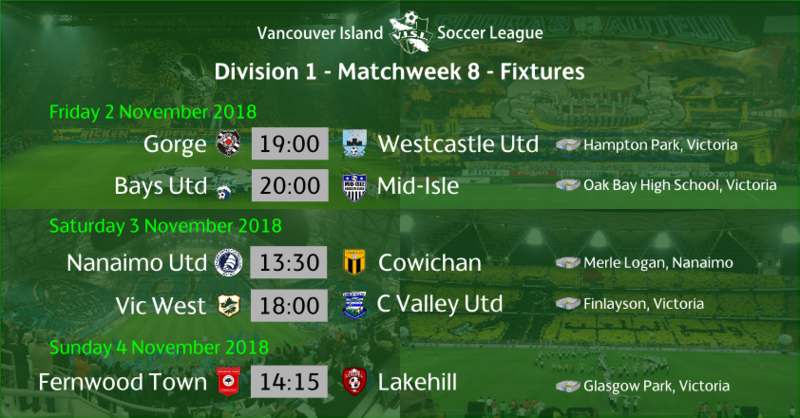 Cowichan will be in town and they look to continue on and surprise all by not only contending in all games they are in, but also having an undefeated record to this point. That should prove to be an interesting match, and partnered up with the other games (Women’s Premier, Men’s Div 2, Youth) on the docket, it should be a great day. The VISL Twitter account will live tweet the game and post plenty of photos come Sunday. Comox will travel down over the Malahat and look for their first points of the season as they take on Vic West. Surprisingly Vic West have struggled out of the gate, but you know they are working on getting more positive results. Sunday will play host to the final Division 1 game of the weekend at Glasgow. Not the easiest of fields to play on, this will be a good test for the Lakehill lads who typically play on turf. Fernwood have been in a lot of games this year, but will need a special effort to get some points off the Reds. Get on out and enjoy some local soccer and see your local community players.